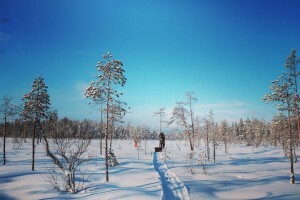 Hossa is a remote country village and a National Park area situated in the backwoods of eastern Finland, near the Russian border and below the Arctic Circle. It´s a place where you can experience Finnish nature, local culture and the authentic way of living in a relaxed way, away from big crowds. Getting here is fairly easy; the nearest airport (Kuusamo, KAO) with inbound, one hour flights from Helsinki is only 80 kilometers away and the roads are kept in good condition all year round, despite the weather! 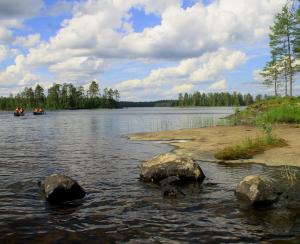 In the year 2011, Hossa hiking area was voted to be the best nature travel destination in Finland and in June 2017, the area was chosen to be Finland´s 40th National Park. 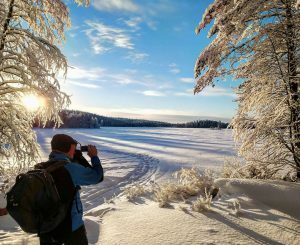 There´s over 90 kilometers of marked, easy-to-hike routes and 60 kilometers of maintained cross-country skiing trails during the winter, not forgetting excellent setting for canoeing, camping, picking/collecting/catching and cooking wild foods, nature photography, sauna, snow-shoeing and witnessing the dance of the Northern Lights. Best thing is that these trails and routes go through grand ridges and hills covered by pine forests, bypassing sparkling clear ponds, lakes and rivers. There´s still vast forests in the area and certain habitats are kept in their natural state – brown bears, wolverines, wolves and lynxes wouldn´t roam here if it wasn´t so. The scenery is beautiful in a harsh way and also culturally and historically significant, showing us visible signs of the stone-age hunter-gatherers and the time of complete subsistence living that was reality here only 60 years ago. In this area, people are still very close to their roots and this is clearly visible in daily life, living with the cycle of nature by hunting, fishing and foraging are normal tasks for many local people here.